We have been staying with our uncle in Marburg. Max has played tennis with a local boy, Eric, who is 9 on astro turf courts with sand on them - he is learning to slide. 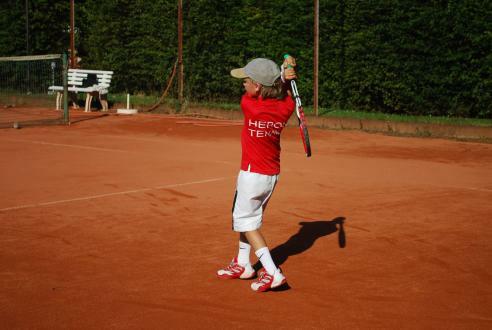 We also went to TC Marburg and Max hit with one of the seniors on bright red clay. We spent a day at the Opel Zoo near Frankfurt - our first look at elephants. We hope to see more soon (though not in europe). It is very hot here - we miss the sea! Thanks for the messages from Meggie and Luke T. We miss our friends and are very happy to hear from them!